You know, I put De-Lovely on my Netflix queue a really long time ago, mostly because it sounded interesting, was about Cole Porter, and starred Kevin Kline, who is generally awesome. For some strange reason, it never occurred to me that it would be a musical. But why on earth wouldn’t it be? Did I mention it was about Cole Porter? Sometimes my brain, she don’t work so good. Anyway! Movie! Yes! De-Lovely is the story of Cole Porter’s relationship with his wife, Linda (Ashley Judd). They were married for 35 years, until Linda’s death in 1954. Theirs was, in some ways, a marriage of convenience, designed to provide a cover for Cole’s homosexuality and to give “social status” to Linda. Despite this, theirs is a singular kind of love story. In the movie, anyway. Said movie is structured most interestingly: at the end of his life, Porter (played by Kline, in case you missed that) is looking back, and his reminiscences take the form of a musical, directed by a slightly shadowy individual (Jonathan Pryce) who is presumably some aspect of Porter himself. The story of Cole and Linda plays out for Porter just as it does for us, moving fairly seamlessly from the empty theatre in which Porter watches his musical to the on-location scenes that make up the movie for the viewer. It’s all there: how they met and married, Linda’s abusive ex-husband crashing the wedding, Porter’s various dalliances with young dancers and actors, his rise to fame and subsequent move to Hollywood, and later, the horseback riding incident that would ultimately leave him with only one leg, and Linda’s eventual surrender to emphysema and Porter’s depression at the end of his life. It’s a beautiful movie, with performances to match. Kevin Kline, normally somewhat over the top, is truly impressive here. It’s a fairly dramatic movie, but he plays it with such subtlety. The point of the whole thing is for Cole to realize that he truly did love his wife, and that she was in fact the cornerstone of his life. Ashley Judd is also excellent as Linda, bringing strength and sparkle to a woman who seems to have been a bit of a saint, encouraging and championing her talented husband, and turning a (largely) blind eye to parts of his life that excluded her. The movie really is just about the two of them, with all of the other characters fading in and out as the years go by. The musical performances are, of course, excellent, and pretty interesting … for the most part, they feature a variety of known singers: Robbie Williams, Elvis Costello, Alanis Morissette (! ), Diana Krall, and Natalie Cole, among others. Once I caught on to what was happening, I waited excitedly to see who else would show up, and when Jonathan Pryce himself finally got a chance to belt a bit in the last “scene,” it was a fitting closing number indeed. Visually speaking? Stunning. I think it’s impossible for anyone to make a movie about the upper class in the 20s and 30s and not have it just be gorgeous, with the fabulous clothes and the colors and everything. The hair and makeup department on this film truly outdid themselves, although I will say that I didn’t think Ashley Judd ever managed to look old, so much as like someone who’d been made up to look old. I guess she’s just that (de-)lovely. Hee. Overall, I have somewhat mixed feelings about the movie. It’s a little slow, to be honest, and the initial set-up of the “musical” was a little confusing and hard to get into at first. Ultimately, the story itself is very compelling, and I will admit to bawling a bit in some scenes, but … it was perhaps a little too understated as a whole. 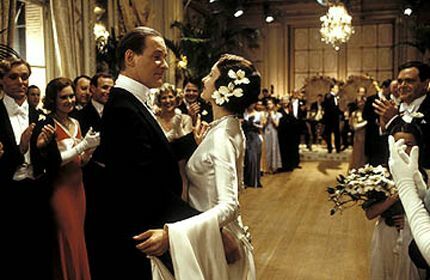 I think that because Porter’s emotional ambivalence was a key point, it made it difficult to really identify or sympathize with him, Still, when the stars of a film are Kevin Kline and the music of Cole Porter, I guess it would be hard to go terribly wrong. In the mood for something retro? Love Mr. Kline? Give it a shot. I like Mr. Kline though I wasn’t that interested to see this before. But after reading this, I just might give it a watch one of these days. I have never seen this movie after reading this i will rent it. This was a good movie, I, too, enjoyed seeing the modern artists performing Porter’s songs. In fact, my biggest dislike with the movie was how many scenes they focused on Ashely Judd smoking. I was beginning to wonder if the director was a smoking fetishist, but then when her storyline came to its conclusion the smoking scenes made sense.